1-16 oz. Block of Cheese. I use ALDI's version of THIS. 2 Cups of Plain Bread Crumbs. Spray Butter, or Spray Olive Oil. Note: This recipe is enough to feed a party of 20. Now, you can substitute the bacon for ham pieces, the macaroni noodles for any other type of noodle, and the cheddar shredded cheese for any other type of cheese. That's what makes this recipe so fun! You can get creative with it yourself by swapping out some of the ingredients. Cook the bacon in a skillet. Half the package at a time. During the first half, add in 1/2 a cup of brown sugar evenly across the bacon. Let it cook and repeat with the second half. Set the finished bacon aside. Boil the macaroni noodles and strain. Put back into the boiling pan. Combine the butter, block of cheese, and noodles in the boiling pan. Mix. It is helpful to pull the cheese apart in chunks and cover with the hot noodles a few minutes and then mix. This lets the cheese melt a little and it is easier to mix. In a large aluminum disposable pan, empty out half the macaroni evenly across. Tear the bacon into pieces no more than 1 inch long and evenly top the first layer with half the bacon. Evenly top the first layer with shredded cheddar cheese. Repeat with the rest of the mac, and finish by adding the rest of the bacon and shredded cheese. Bake at 350 and take out when the sides and bread crumbs start to brown. Add salt and pepper to taste. You may top with chives, or another favorite herb, for looks. A good time to do this is before baking. Add the herbs to the top of the bread crumbs and then spray with the butter or oil. 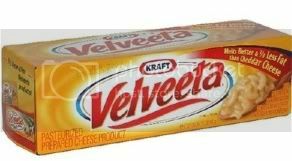 what kind of cheese do you use for the 16oz block of cheese? You can find it near the chips and salsa in ALDI stores. :) I believe it is around 2.99. I'm not a big bacon fan, but this sounded good, so I made it last night. Everyone LOVED it, and it was declared "a keeper!" When I make mac and cheese with the cheese spread (my youngest brother calls it "super cheese"), I add a can of evaporated milk instead of the butter, which is what I did when I made this. It makes it really creamy good!